I do not speak for Mr. Jackman. If he or one of his representatives reads this article and would like to dispute it, I am open to that discussion. Full disclosure though, my lawyer can dunk and run a sub six minute mile, so I feel pretty good in any litigation. If Hugh Jackman, the jacked actor that played Wolverine for 17 years in the X Men movies, worked out in Watkinsville, I feel very confident in saying that he would train at Core Blend. After watching him workout on Instagram, researching his personal trainer (the very sharp Dieter Roylance) as well as the facility that he trains at in Australia, I have no doubts about this. Let’s dive into the evidence. 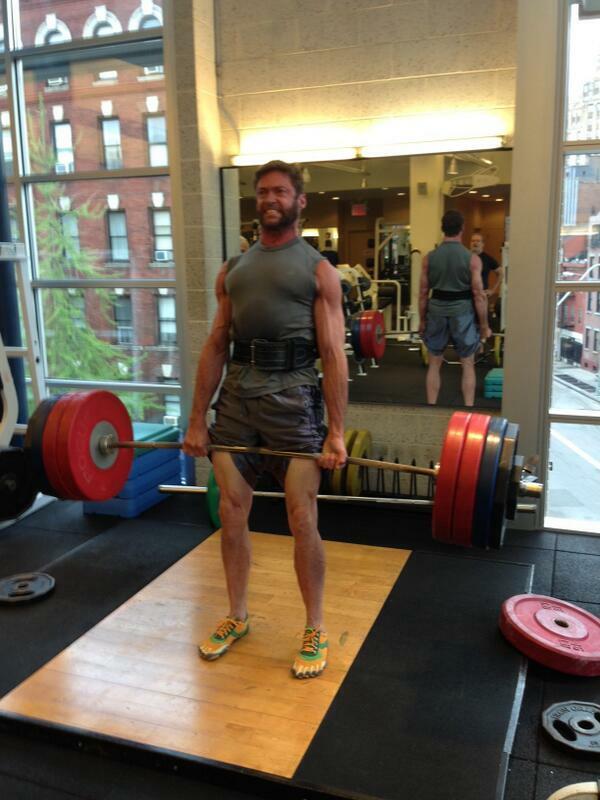 Hugh Jackman deadlifts. A lot. Here look: That is a lot of weight. I can’t tell for sure, but that’s somewhere between 445 and 465 pounds. That’s a legit lift. You know what other gym deadlifts a lot? Core Blend. We have over a dozen guys that have pulled over 500 pounds and another half dozen that are pulling over 550. Hugh would want a place with a deadlift bar. He would want a place with plenty of weight. He would want a place that had other lifters and trainers that knew what they were doing to help keep his form right. He would fit right in at Core Blend. Hugh Jackman can row 2000 meters in 7 minutes. That is a legit time. What other gym has a lot of guys that can row 2000 meters in 7 minutes or less? Obviously it’s Core Blend. We have videos of guys doing it on Youtube. You can see guys doing them on Instagram. We have 13 men that can beat 7 minutes on a 2K row. When the Wolverine walks into the gym and needs to get some cardio, he’s hopping on a rowing or ski machine with us. He wants to do entertaining cardio, he wants to push himself. He’d definitely be hitting intervals on the sled and ski and row with us. No doubt. Hugh Jackman does curls. I won’t name any names, but there are a lot of gyms that think they’re too good for curls. A lot of facilities that would welcome someone hitting up some deadlifts and some rowing would turn their nose up at a man that wants to work on having great biceps. A lot of places that preach functional fitness don’t see the functionality in having big arms which is something that I really can’t abide. Core Blend has curl bars. Core Blend has Dumbbells from 2.5 to 125 pounds. Cable machines. Fat Gripz. Fat Bells. Fat Bars. Ropes. If you want thick arms, I think it’s clear that this is the place to train. So what does this mean to you? Why would I take the time to prove my case that hypothetically a famous Hollywood actor would train at my facility? It’s simple. If you would like to be fit and jacked into your 30’s, 40’s, 50’s and 60’s then it’s time to come train like it at Core Blend. “You can’t coach speed” is a well worn adage by coaches that aren’t very good at making athletes faster. In fact, I don’t think there’s a bigger gap in fitness between what parents think good speed training looks like and what it actually is. It’s a shame too, because there are a number of training practices that are very effective with youth athletes that are not nearly as effective with teen and college athletes. Sadly, most parents don’t get their child involved in smart effective training until they are in their mid teens, where it is much harder to have an impact on certain aspects of speed. Although I see a lot of mistakes in speed training with teen and college athletes, I’d like to focus this blog post on the specific training practices that should be used on youth athletes. Overspeed Training. Overspeed training works by having an athlete sprint faster than they are currently capable of. Towing, Band Work, Downhill sprinting, and contrast training would all be a part of this. The developing athlete’s turnover/stride rate can be increased by changing the activity of the CNS. The developing brain makes this an ideal time to make real changes to the athlete. This work is not NEARLY as effective later and is a huge priority of youth training. Mobility: Developing athletes have great flexibility (typically), but must work to get their mobility to where it should be. Learning how to control positions rather than “falling” through them is key for maximizing efficiency as well as safety. Focus on Safe Movement Patterns: Youth athletes should be taught how to apply force and from what angles. This ensures that they get into good positions and don’t get hurt. Rehearse with Cone Drills: Cone drills can be used to rehearse movement and confirm that athletes are getting into the proper positions. This is especially useful for youth athletes, but with every rep we as coaches need to make sure that the athletes are getting into safe and efficient positions. Use Plyometric Drills: Developing athletes need to learn how to produce force quickly and maximize their own strength prior to beginning true weight training. Plyometric Drills focusing on short ground contact time are an ideal way to do this. Have Fun: Kids are kids. Everything should be fun and enjoyable so that they want to do more. Competition with others will also get them to push to their fullest. Do Too Many Reps: Too many reps will turn it into conditioning rather than speed work and the young athletes will get too tired to be effective learners. Conditioning can look like speed work, but it isn’t. If the athlete starts to make mistakes out of fatigue then they are probably working too hard to learn movements. These fatigued movements will also not be as fast and explosive as we would like. Rely on Cone Drills: Sports are chaotic and too many cone and ladder drills don’t allow athletes to react to what they’re seeing. Rely instead on drills with human movement or decisions. Cone drills often rely on rote memorization rather than decision making. Equip the athletes with the tools to move properly and let them make decisions. Rely on Ladders: Ladders don’t teach quick feet, they teach feet that don’t move anywhere. Good technique on a speed ladder is to touch in different positions while not applying force. The feet must apply force every time they touch the ground. Speed ladders teach the OPPOSITE of what we need athletes to do. Every plant should have a purpose, not leave the athlete motionless at their center of gravity. If you know me, you know that one of my closest friends in the world is Reese Hoffa. He’s had a huge influence on me both professionally and personally in a myriad of ways that I probably don’t even realize. If he hadn’t seen something in me and given me a shot at writing his workouts in 2011, it’s likely I don’t open up a gym in 2012. If I don’t open up that gym, I don’t meet most of the groomsmen in my wedding or my wife. Without his faith, I am probably stuck in a job I hate, rather than writing this blog post from my office while my dog takes a nap at my feet. He’s a great husband and shows me how to be a better one and a great friend, showing me daily how I can be a better one of those too. You might know someone like Reese and I hope that you learn lessons from them too. However, your friend isn’t the best in the world at what they do, and that’s something that Reese brings to the table. When I was in college, I read about Reese Hoffa. He was in the middle of a phenomenal run that ended with him being ranked in the top 3 in the world for 10 years in a row. He was a mythical type of being to me. I knew that he wasn’t a regular guy because if he was he wouldn’t be the best in the world. I remember seeing him eating at a Mexican restaurant and being amazed that a guy like that would be eating in the same place as me, a regular guy. He was the best in the world and he was doing something that a regular guy like me would do. Fast forward a few years and my perspective is different. I still think Reese is great, but now I see that he’s a regular guy just like me. That doesn’t diminish who he is or what he accomplished, but it does make me think that I could do the same thing. Reese worked incredibly hard. He wasn’t a world class athlete as a high schooler. He wasn’t a world class athlete in college. He worked multiple jobs and pushed himself to be his absolute best and never let any limitation hold him back. There’s no reason I can’t do the same thing. There is someone in the world that is better at training than everyone else, why can’t it be me? Why can’t I operate the best gym in America? I think it’s easy to look at someone successful in their field and think there’s something different about them. They were just born lucky and that’s why they’re in that spot, but I know the best shot putter in the world so I know that isn’t true. Reese earned his spot. He wanted to be the best in the world and he did it. Being the best gym in Athens is not enough for me. I want to operate the best gym in the world and that’s exactly what I’m going to do. Being friends with Reese has made me raise the bar on what I expect from myself. I can’t sit back and delude myself into thinking that I can’t be hugely successful because I’ve got to watch Reese do it. I have no idea what your goals are. I have no idea who you look up to in your field. I do know that they’re regular people and you could do what they’re doing. If you’re reading this and think I’m wrong, then it’s because you don’t have a friend like Reese.